This chapter begins with an explanation of basic principles of map folding. Although the US Patent Office issued its first map-folding patent in 1889, these patents were relatively infrequent until the 1980s, when map-folding schemes such as the starburst and Z-card became more complex, more numerous, and more difficult to manufacture. After 1985 foreign inventors, always a part of the American patent system, became proportionately more prominent. 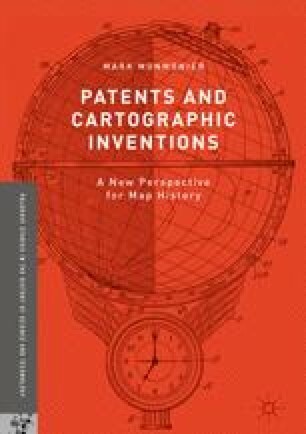 These more recent map-folding strategies relied upon innovative machines customized for efficient mass production—machines that constituted a parallel stream of inventing and patenting bolstered this surge of map-fold patenting. With convenient compactness achieved, the wave subsided and innovative map folding became a dying art as patents expired and clever entrepreneurs turned to copyright’s more enduring protections.